This is a brief user guide for exploring the FAME search interface, that discloses the archive of radio broadcasts from Omrop Fryslân in the period 1955–2000. On the start page you can type one or more search terms in Frisian or Dutch. These terms can include names of people, places and radio programs. Clicking the search button (the magnifying glass at the right) takes you to the search results. The results are shown on the right half of the screen, as separate ‘cards’. They are organized in terms of the original recording, identified by the tape that was digitized for this archive (“Band”). 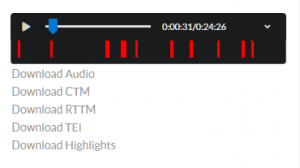 The search terms can be found either in what has been said in the broadcast audio, or in the metadata: the name of the radio program, known participants, a short written description, etc. Within each returned card, the metadata is shown in the top left part. If the terms were found in the spoken audio, small excerpts of the spoken tekst are shown in the lower left part within the card. In either metadata or spoken text, the search terms are highlighted in red. On the left of the screen, you can refine the search results based on the metadata known about the radio broadcasts: era, duration, people, genre, etc. You can also select broadcasts for which the audio is available online. If such audio is available in a search result, a small audio player is displayed at the top right of the card. You can play/pause audio, and drag the slidebar to navigate within the archived broadcast. If you click the v-shaped hook in the right part of the audio player, it will expand to show you where in the broadcast the search terms were found, with time spanning the entire player from left (start of the broadcast) to right (end). You can directly jump to these found terms by clicking the red bars. Privileged users (researchers entitled to a CLARIN authentication) log in via https://onderzoek.zoeken.fame.frl/. For them the raw audio and speech recognition results are available for download. The links for these are then shown beneath the player as shown in the picture above.